Ingredients containing any of these words, commonly found in skin/hair care and cleaners, will more than likely contain Palm or derivatives: Stearate, Stearyl, Cetyl, Cetearyl, Sodium Lauryl Sulphate (SLS), Sodium Laureth Sulphate, Sodium Dodecyl Sulphate (SDS or NaDS), Sodium Stearoyl Lactylate, Calcium Stearoyl Lactylate, Steareth 2 and Steareth 20, Stearic Acid, Myristic Acid, Lineolic Acid, Glycerine, Retinyl Palmitate, Myristyl Alcohol, Caprylic Capric Triglyceride, Capryl Glycol, Sodium Myristate, Cetearyl Alcohol, Retinyl Palmitate etc……..and the list goes on..
None of us want the Orangutans to loose their habitat due to deforestation in order to farm Palm. Be sure that you choose Palm Free or at the very least 'Sustainable Palm'. 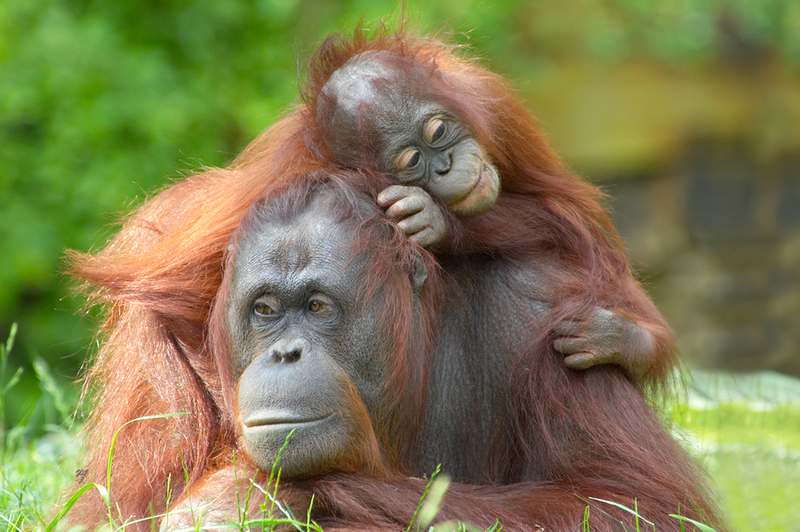 Now back to Easter and Chocolate, YUM………..
One way of ensuring that your Easter is Orangutan friendly is to make your own Chocolate. No, don't shudder, it's really simple…..promise…………. Place the Cocoa Butter into a double boiler and gently warm till it has all melted. Be careful not to heat over 42 deg C. Once it is completely melted add all the other ingredients and use a balloon wisk to mix thoroughly. If using honey I recommend using a 'stab mixer' to more evenly distribute the honey through the mix. Pour into chocolate moulds or cup cake papers which have a tray underneath. Once poured, refridgerate for 1-2 hrs to set, or alternatively 30mins in the freezer. If you have used honey you will find that as it cools the honey will 'sink' slightly leaving a sweeter more sticky bottom to the chocolate. I call this a design feature rather than a fault! To shake things up a little you can add all sorts of goodies like nuts, dried fruit (raisins, apricots, goji/blue/cranberries), shaved dried coconut flesh, spices like cinnamon and even chilli if that's your thing. Be warned these chocolates are very "MOORISH"! There are many health and nutritional advantages to using Raw Cacao over processed Cocoa and using Coconut Oil which I will cover in another post, so stay tuned!